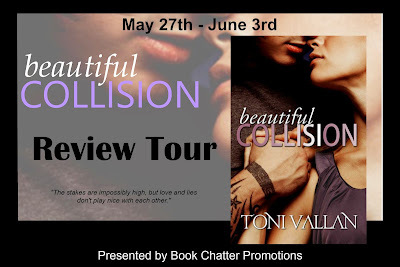 The Reading Chameleon: Beautiful Collision by Toni Vallan Review Tour! Eighteen year old Gray McAllister is on the run. Leaving her dangerous past behind her is easier said than done, even when she finds herself at last able to forge a new life. But then the planets align and Gray finds herself bumping into super-hot Thane Blackwell. Drooling over him from afar is safe but that's only until she is forced to look after Thane while he recovers from surgery. Being holed up in her apartment is a bad, bad idea. Can Gray control the fire that Thane seems to light inside her, or will she give in to her deepest desires. Can Thane achieve his goal without hurting Gray in the process? The stakes are impossibly high, but love and lies don't play nice with each other. Will Gray's past catch up with her first? Or will Thane's own secrets explode and tear them apart? This book starts while Gray is on the run and there are people following her and watching her. As she goes to her destination you get the backstory as the story moves forwards. Sometimes in memories sometimes just by what she says. Beautiful Collisions is written in Thane’s and Gray’s P.O.V. While sometimes dual points of view tend to be a little confusing I thought the author did a good job on keeping it from being confusing and making their points of view interesting to read. I did find the flashback parts confusing at times. I found Thane to be kind of interesting. At least more interesting than Gray. There was the whole mystery as to why he was watching Gray and what exactly his intentions were. At the end you get the reason why he is so invested in Gray. So, Okay the characters were decent. The story was okay, a little slow but still kind of interesting. I found myself bored at some parts but I think things started picking up towards the end of the book, but by that time we get to the cliffhanger ending. I wouldn’t say not to read this book. It deals with some interesting issues and like I said the characters are decent and their were points were the story grabbed my attention and held it. I will be picking up the next book because I’m interested in seeing what happens between Thane and Gray and I really want to know how it ends.